A juvenile Bald Eagle paying close attention to his surroundings in Homer, Alaska in the USA. As you can see by this juvenile Bald Eagle standing along the waters edge in Homer, Alaska, its plumage is a mixture of brown and white which molts in various areas at different times. It can sometimes take about six months for the feathers to replace themselves and about five years for the feathers on their head and tail to change to white. The juvenile Bald Eagle has a black bill and you can tell when it is nearing maturity as it will change to a bright yellow. The eyes also change to yellow as it ages. The beak on this Eagle is already starting to change and so are its eyes. 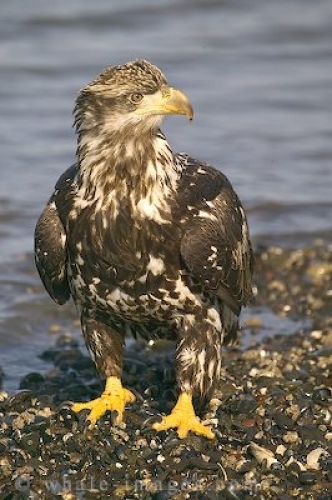 Sometimes a juvenile Bald Eagle is incorrectly identified as a Golden Eagle except that the main difference being that they have a considerable amount of more white on their feathers. Learning to hunt is something that the parents of the Bald Eagle cannot teach their young. They have to watch their parents in action and practice on their own. If touring Alaska, head to Homer where you can see hundreds of adult and juvenile Bald Eagles annually in the winter. Homer, Alaska in the USA is a well known place to view these magnificent birds of prey.